13 Ways of Looking at the Novel, Jane Smiley, Knopf, 2005, ISBN 9781400040599, 608pp. One of the ways to consider this unusual book by Pulitzer-prize winning author Smiley is as an instruction book. I purchased this because it came up as a featured selection of the Writer’s Digest Book Club, and its as good a book regarding the process of writing a novel as any I’ve read, and better than most. Smiley points out that, unlike many other artistic endeavors, the novel is one that doesn’t require much equipment (paper and a pen/pencil). What it takes, more than anything is motivatioon and perseverance, as it is simply the accrual of words into sentences into paragraphs into pages. She underscores that getting your novel published is a different matter entirely, but if you want to write one, you likely have the ability. The writing of this book itself was not necessarily as a textbook for writing programs, although Smiley has taught creative writing, but as therapy for Jane Smiley’s own writing. From the text, it seems that Ms. Smiley was having problems with a recent novel of her own, and decided to undergo a course of reading (originally 275 novels, shortened to 101 after she began) that helped break the mental block she had about her novel and also gave insight into the “question of the novel” itself. 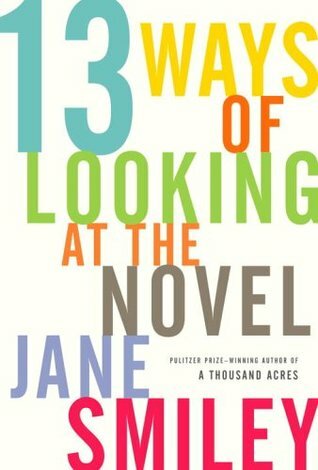 To get there, though, Smiley covers a number of topics including a history of the novel as an art form: one of her thirteen ways of looking at the novel is through the lens of history, tracing the growth of the novel from Don Quixote. Another interesting portion covers the philosophy of novels, making the case that novel-reading is something of a subversive activity, as it incubates an ability to see multiple points of view (each novel, for example, requires that you try to understand at least one protagonist whose point of view is unique and unlike your own), thus leading to a more liberal view of the world (as opposed to a conservative, one-view-fits-all view of the world). My favorite part of this book, and what likely will live on with me long after it has become just another book on my writing shelf, is how Smiley sees the novel as a game for both the reader and the writer. The reader expects the writer to follow the rules of the novel game: once a character and a setting are created, that the characters will proceed along the pages according to cause-and-effect relations (i.e., the plot) until a resolution is obtained. This is most apparent in the mystery genre, where the reader even tries to determine from clues presented by the author early on what the likely cause-and-effect resolution will be. But the game metaphor is even stronger for the writer, who gets to “roll the dice” for the characters and make those determinations of cause-and-effect according to what they think the most likely occurance would be. Some writers even complicate this by playing additional games as they write, trying to incorporate themes (in a novel about birth, the writer tries to make sure all the images reflect eggs, for example) or allusions to other works, places or events. As a game-player, I am surprised I had never thought of writing as just another game, but now that I’ve read Smiley on the matter, I feel like I’m never going to see it any other way, as it has changed my entire view of the process. Half of the book is given over to a reading diary of those 101 novels that Smiley read on her way to creating the other half of the book. As someone who’s been writing such immediate impressions on books as he’s just read them, I admire her descriptions and commentary, even while feeling somewhat abashed at how few of these books I’ve read, although Smiley makes pains to state that her list is not a “Best Novels” list. If anything, it goes to show you that there is an incredible wealth of great literature to be had, and I’ve already marked a number of books from her list that I want to now read. I’d highly recommend this book for both aspiring writers as well as anyone who likes to think about what they read.